M139 QUATTROPORTE POWER STEERING PUMP. 2014-2016 Maserati Ghibli. Quality re manufacuried power steering pump, pressure tested. 2004-08 Maserati Quattroporte models with 4.2L V8. Up for sale is a used power steering pump for the following applications We are located in Albany, Oregon. To see all MASERATI parts that we have in Inventory. This Part is from a 15 MASERATI. Model: 15 MASERATI. Quality Tested OEM Auto Parts from Pacific Motors | The Anti-Junkyard. Happy viewing! Ghibli (2014-2016). Ghibli S (2014-2016). Ghibli S (2017 ). Ghibli S Q4 (2014-2016). Ghibli S Q4 (2017 ). Genuine Maserati Power Steering Fluid Cooler. Quattroporte (2013 ) S. Levante S.
Free Shipping! 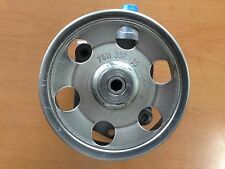 Power Steering Pump Pulley & Reservoir 204070 M139 2005-11 . Free Shipping! Power Steering Hydraulic Servo Control Pump & Pulley 187920 Maserati 4200 Gransport M138 2002-05 . Removed from a 2006 Maserati Quattroporte M139. Item is an OEM part and may have visible wear from normal use. Do not attempt to operate before replacing fluids and filters. Provide any details of your claims process to Highline Auto Parts. Maserati Part #: 211697. This part is used but still in good working condition. We currently have several fresh Maserati Quattroporte's that we are parting out. Power Steering Hydraulic Servo Control Pump & Pulley 268447 7617955170 Oem Maserati Ghibli Quattroporte M156 M157 2014-17 . P/N 670031618. Maserati Part #: 670031618. This part is used but still in good working condition. We currently have several fresh Maserati's that we are parting out. Maserati Ghibli, Power Steering Cooler, Used. Part Number: 204070. Maserati M139 Quattroporte 04-08. Model: M139 Quattroporte. Condition: GENUINE MASERATI PART! Used, tested working. Make: Maserati. WILL THIS WORK FOR MY CAR?. Parts are removed from clean, rust-free Southern cars. Free Shipping! Set of 2 Power Steering Cooler Hose Line Pipe 210379 212179 Quattroporte M139 2005-11 ; PSH . Maserati Part #: 237283. This part is used but still in good working condition. We currently have several fresh Maserati Granturismo's that we are parting out. P/N 193537. Maserati Part #: 193537. This part is used but still in good working condition. We currently have several fresh Maserati's that we are parting out. Maserati M128 Coupe, Power Steering Cooler, Used. Ferrari Part #: 386100025. This part is a new OEM Genuine Maserati part. We currently have several fresh Maserati's that we are parting out. , part# 227560 ; Fits the following models : Maserati GranTurismo (2008) 4.2, QTP. (2010) 4.2, QTP. (2010) 4.7. DONOR CAR: 2005 MASERATI QUATTROPORTE RWD ext. code (GRIGIO NUVOLARI) int. LEFT SIDE IS THE DRIVERS SIDE AND THE RIGHT SIDE IS THE PASSENGER SIDE . We always take care of problems to the best of our ability. We will respond. for your peace of mind ! Canoga Park CA 91304. 9005 Eton ave.
Power Steering Pump & Pulley 268447 Oem Maserati Ghibli Quattroporte M156 M157 2014-17 . Part number: 205784. Maserati M139 Quattroporte 04-08. Removed from a 2006 Maserati Quattroporte, Black with Tan Interior, VIN Number ZAMCE39AX60022037. Vehicle ran and drove. Condition: GENUINE MASERATI PART! This part is used but still in good working condition. We currently have several fresh Maserati's that we are parting out. Maserati Part #:187920. Free Shipping! Set of 2 Power Steering Cooler Hose Line Pipe; 210379 212179; Maserati Quattroporte M139 2005-11 ; PSH . IT ALSO HAS A SWEET MFG 30020 6IN DIA PULLEY, THE PUMP NUMBER IS A 7849701 PRETTY NICE COMPACT UNIT. 283 302 327 350 3731548 3737739 3756519 3782870 3789935 3790721 3791362 3858174 3858180 3892657 3903352 3914660 3914678 3932386 3956618 3970010 2680 4577 1178 1182 3731539 3740997 3743056 3748770 3760116 3767465 3774692 3782461 461x 3890462 3917291 3927186 3927187 3947041 3973414 3973487 3782725 3731394 3739653 3794129 3795397 3844461 3890490 3917610 3932472 3959594 3972110. Part Number: 210379 212179. Maserati M139 Quattroporte 04-08. Model: M139 Quattroporte. Condition: GENUINE MASERATI PART! Used, tested working. Make: Maserati. We are here to help! Information and videos of donor vehicles. This part is used but still in good working condition. We currently have several fresh Maserati's that we are parting out. Maserati Part #:199892.